Beijing is the caipital o the Fowkrepublic o Cheenae. The ceety is kent as Peking an aw. It's locatit in the nor'east o the kintra. The Forbidden Ceety, hames tae the Emperors o the Ming an Qing Deenasties. The ceity o Beijing haes played a gey important pairt in the oncome o Cheenae. Mony fowk fae ither ceeties an kintras haes flittit tae Beijing tae leuk for wark. Near-haund 15 meellion fowk bides thare. In 2008 Beijing hostit the Olympic Gemmes. Beijing haes a kenspeckle history. Syne the Jin deenasty, Beijing's been the caipital for mony deenasties, sic as the Yuan, Ming, Qing, an ithers forby. Thare's mony places o historic interest in Beijing. Thir places includes the Simmer Pailace, the Temple o Heiven, an the Great Waw o Cheenae. Beijing means "the northren caipital" in the Cheenae leid. It wis ance a coonterpairt tae Nanjing, "the soothren caipital", durin the Ming Deenasty. This deenasty gied Beijing its name. 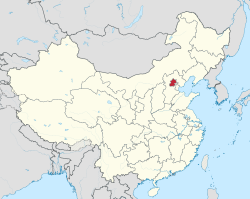 The middle o Beijing wis settelt in the 1st millennium BC. In thae days, the Kinrick o Yan (?) set up thair caipital whaur Beijing is the day. Thay cried it Ji (?). Efter the Kinrick o Yan wis malafoustert, the ceity becam wee-er, awtho it wis still an important place. Beijing becam mair important again in the 10t century, whan the Jin deenasty set its caipital thare. This ceity wis malafoustert bi Mongol arimies in 1215. Then in 1267, Mongols biggit a new ceity on the north lip o the Jin caipital, an cried it "Great Caipital" (??). That wis the beginnin o modren Beijing. Whan Kublai Khan, the Mongolian monarch, set up the Yuan deenasty, this ceity becam his caipital. The Yuan, Ming, an Qing deenasties aw uised Beijing as thair caipitals. Whan the Qing deenasty tint pouer an the Republic o Cheenae wis establisht, the new Republic muived its caipital fae Beijing tae Nanjing. Whan the communists claucht pouer an estaiblisht the Fowk's Republic, Beijing becam the caipital o Cheenae ance again. ↑ Paris and Rome are "partner cities" due to an exclusive agreement between those two cities. "Le jumelage avec Rome" (in French). Municipalité de Paris. Retrieved 2008-07-09. ↑ "International Relations – São Paulo City Hall – Official Sister Cities". Prefeitura.sp.gov.br. Retrieved 1 June 2010. ↑ "Canberra's international relationships – Canberra's international relationships". cmd.act.gov.au. Retrieved 20 October 2009. Wikimedia Commons haes media relatit tae Beijing.